B.F. Riecke, R. Christensen, P. Christensen, A.R Leeds, M. Boesen, L.S. Lohmander, A. Astrup, H. Bliddal. 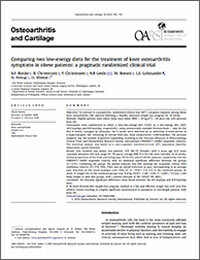 1063-4584/$ @2010 Osteoarthritis Research Society International. Published by Elsevier Ltd. All rights reserved. doi:10.1016/j.joca.2010.02.012. Comparing two low-energy diets for the treatment of knee osteoarthritis symptoms in obese patients: a pragmatic randomized clinical trial.